Well, I'm not sure I know what all the fuss was about. 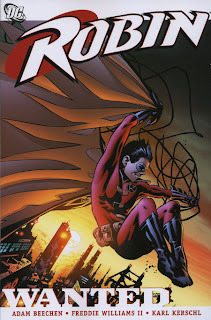 Adam Beechen's Robin, premiering in Robin: Wanted is very solidly done, and after the first trade, probably the best written (or at least, the least objectionable) since Chuck Dixon. Of course, I get where the whole Batgirl-gone-crazy controversy may have put some people off, but in all, for what I can only consider to be a poor editorial idea, I think Beechen framed it quite well, following in line with what Andersen Gabrych began in Batgirl: Destruction's Daughter (see the Collected Editions review here). Beechen's Tim Drake feels immediately more natural than the "hipster cool" voice with which the character was written by Jon Lewis, and without the jarring pacing and supernatural elements in Bill Willingham's run. In just the first two chapters, Tim gets framed for murder and must break in to -- and out of -- police headquarters. There's a fantastic, frenetic pace to the stories that feels youthful, while at the same time perfectly grounded in the overall Batman universe. Robin is depicted here as both a hero and a detective befitting both his time on the job and his status as leader of the Teen Titans, and it's refreshing to see that portrayal in his own title. One can discern from various interviews (one at Comic Book Resources) that plans for the Batgirl character, Cassandra Cain, were neither entirely Andersen Gabrych's nor Adam Beechen's. I applauded Gabrych for making Batgirl's turn to madness emotionally gripping, at least. In Wanted, Beechen offers another plausible reason for Batgirl's turn to evil, the revelation of a sister she never knew she had, leading her to believe that her father Cain though of her as replaceable, and that Batman believes Robin replaceable, too. Beechen smartly gives weight to Batgirl's claims by making Robin momentarily doubt his relationship with Batman, even as he knows his fears are groundless. What follows is a preciously awkward scene between Batman and Robin that showed a markedly different Batman in DC Comic's post-Infinite Crisis era. The final two chapters of the trade would be a classic heroes-misunderstand-and-then-team-up story, if not for the fact that the new Captain Boomerang's father murdered Tim Drake's. Beechen avoids melodrama here, and frames the story within perfect sidekick fare -- Robin and Boomerang go on a scavenger hunt not after villains, but after abandoned villain hideouts -- letting the conflict between the two heroes unfold naturally. They end not as friends, but with Robin offering Boomerang the grudging respect that the reader can see Boomerang deserves. Robin is a character that, through his most recent incarnations, has built up a lot of angst, but Beechen instead portrays him as a mostly rational young adult. Beechen, frankly, brings a lot of common sense to Robin that feels like it's been missing. Unfortunately, Beechen's only sticking around for the next Robin trade paperback before handing the title off to another writer, but hopefully the tone he's set in this DC "One Year Later" trade paperback will stick around after he's gone. Our One Year Later jaunt continues with JSA, Checkmate, and more. Any requests? Minor correction: if the next TPB (Teenage Wasteland) ends at #162 as the advanced solicits say, there's at least one more Beechen trade coming. My question is why editorial is feeling the need to initiate creative character arcs? That should be the writers job. The editors should be there to help and to be a gate keeper for the legacy not deciding that all of the sudden Batgirl should be crazy or some other character should die or whatever. This is what you get when you put a advertising executive who thinks he's a great writer in charge. Yup, Jeffrey's right on Beechen. Michael -- Yes and no. Dan Didio just mentioned in an interview over at Comic Bloc that "about 75% of [DC's] concepts ... are editorially driven" right now. I see how you could feel that this takes from the writers' individual creativities, and it probably does spell the end of a certain era in comics. At the same time, both DC and Marvel are more universe-driven now--that is, events are affecting the entire line of titles, instead of just individual ones. By definition, that requires more editorial influence than if titles remain within themselves. And I think this is cyclical--the titles were mostly self-contained during One Year Later (with exceptions), and now that we're near another crossover, editorial steps in again. And if this still sounds like too much editorial influence, consider your favorite TV series, written by a team of writers in a room, with an overarching editor or team of editors deciding the season's direction. It's not drastically different here. But hmm ... what are some good writer-initiated arcs in comics history, that wouldn't be possible now? Well the people who usually run tv shows are proven creative people, not failed writers. But my dislike for Dan DiDio aside, I'm not entirely sure what arcs have been writer initiated and what hasn't. I do know over at DC now the whole Young Justice series would be impossible, as would the Giffen/DeMatties,Maguire JLA stories. Hopefully Mark Waid will bring back the fun to the DCU. Right now, DC Editorial is taking the death option too often, imo. I recently heard someone say (and I agree) "death is the new holofoil chromo wvariant cover". At Marvel, editorial's insistance at things like "Civil War" (and the like)have made some stories not impossible but much worse than they should've been. Ms. Marvel's run in with the Brood for example and the arc after it were crunched because of "Civil War" imo. It's no wonder I'm preferring older stuff now.Thank god for Archives and Masterworks! LOL And Dynamite which I think is doing exceptional work as is Dark Horse. Did I miss an arc somewhere that suggests Cassandra was destined for a path of righteousness? That said it's not destined she's a good guy but her destiny changed when she was taken under Batman and Oracle's "wings" (so to speak, *ahem*). She turned a corner and to have her go backwards is what is not sitting right with a lot of people. Well, if you want to get technical, if your formative years as a child are spent learning to kill, and then suddenly you're taking out of that and put into a place where you're shown that killing isn't always the answer--doesn't mean you're going stay on the straight and narrow ^_- There's been many films dedicated to this very notion; I think, if anything, having her appear 'maniacal' the way she did with Robin on the rooftop in "Wanted", was a sign that Beechen was off in his characterization of her. My problem with this storyline was it had a good beginning, great middle, and crappy ending. The turning of Cassandra wasn't what jarred me into hating this storyline so much. It was the fact Beechen used every cliche with in the end during the final part in this story.. I cringed when he had Cassandra do the villainous monologue of why she became evil and why Tim should join her. Way too many words for a character whose vocab wasn't that high. My stomach twisted when the final showdown came down. And in part is the real reason why I hated this arc. Starting off with the fact that to beat Cassandra, Tim throws techinque out the window. If that sort of logic worked then every two bit thug should be able to kill her when she was Batgirl. Even it's a horrible buildup to what he laid in the previous parts. In the beginning in part one, Batman himself states there is no possible way that Tim can defeat her. Yet, he does so in the final part matching physiscally. Why not play head games like Cassandra had with him earlier? Really go for the belt by mentioning what would Steph think? That'd pause Cassandra for a second. Since Tim couldn't beat her physically he could have fought her mentally maybe even show her the error of her ways. Nope throwing techinque out will do the trick. Secondly, throughout this entire arc, Tim's been using his brains not his skill as a fighter. Suddenly he throws out plain thought and fights randomly? Not to mention, in the previous part he has broken ribs that where reinjured then suddenly is able to take out all the ninjas and face Cassandra? This is the freakin League of Assasins. A League that gave Cassandra and Batman himself in their respective books. Yet Tim is able to beat these guys? Then at the end everything is brushed aside with Poppa Cain still being alive and Tim is freed all thanks to Cassandra's taped confession he just so happened to have on during the entire fight to which she actually called him "Tim" many times as well. Sorry but the implausiblity of the final part ruins everything promising established earlier in the story. Honestly yes, I do enjoy some of the stories Beechen wrote for Robin (ex teen sucide and the second arc involving Cassandra plus with drug fueled gang members). But sorry, this particular storyline he dropped the ball just when he was about to score. And honestly I blame editoral for forcing him to write such a hack ending. Anonymous -- I agree with much of what you've posted here: this is a story with a great beginning and middle, that didn't do such a good job at the end. For me, two out of three isn't bad, especially given the difficult circumstances I think Beechen had to deal with--and the fact that, when Beechen was on his own in the beginning, his Robin was so good, gives me hope for his future stories. Stop by when we review Robin: Teenage Wasteland and let us know what you think.